Hi again! Well, we started off our series on the pasture vs barefoot trim with describing the difference between shortening the toe and bringing back the toe, sculpting vs. flat plane trimming etc. In response, in the comments, a gentlemen requested some clarification on the Mustang Roll. I think that's a good topic for today ... so let's get at it. 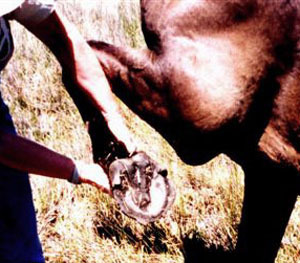 First of all, did you know that the Mustang Roll is not a universal condition of the equine hoof everywhere? Or, even, all the time? Most of them live in predominantly dry, arid environments. Now, not all the world is a dry, arid environment. We have extreme differences of environments even in the same state here in the United States! I presently live in SW Florida which is tropical/sub-tropical. Heck - even in the same county it may differ, come to think of it! I live in a 'sub-tropical' area of Lee County while the southern part of the country can be classified as 'tropical'. The differences may be un-noticeable especially to those who just don't like heat and humidity at all. (They really should be living in New England!) ... but the vegetation knows the difference; the insects know the difference and yes, the horses' hooves may even differentiate! And here are a couple of solar shots: Can you tell which set of hooves is from which type of environment? How can you tell? click on top photo to see original: 2nd photo Marg Richardson, "Australia's Wild Horses"
Wow! What a difference. And that difference is readily apparent in the mustang roll or the lack of! Think of this ... and trimmers, remember this when you're working, -- when running on wet ground or cold, frozen snow ground, just as I said in my post about the bars of the hoof, the horse needs traction, right? And now, think of the lift off of the hoof as it's leaving the ground ... is the ground going to abrade the wall of the hoof, the toe of the hoof if it is soft and wet or frozen and snowy? Or is it going to require that the horse has some traction to the toe to keep the hoof from slipping? A well rounded mustang roll on a hoof on this type of ground is just an accident in waiting. 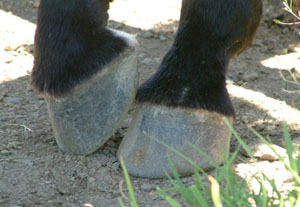 Now think of this ... and again, trimmers, remember this -- when working on hooves living on dry, arid ground, as the hoof leaves the ground in flight, what happens to the toe of the hoof? Is it going to be abraded by the sand, the dirt, the stones, rocks, packed hard ground? Some horses will sport mustang rolls and some won't. In the wild it is entirely dependent upon the environment and season in which the horse lives. If we're going for a 'natural' hoof, doesn't it only make sense that, instead of trying to create a hoof that LOOKS pretty in the pictures that we try to emulate what the natural hoof in its own environment would look like for optimal functionality? A mustang roll could spell disaster on a horse that lives in New England during the wintertime. On the other hand, in the dry summer, that same hoof in New England is going to be worn by the terrain -- and will form its own mustang roll if left on its own devices. Think of the environment in which YOUR horse lives -- should he always sport a nice msutang roll? Or should there, perhaps, be left a sharp edge for extra traction? And please don't misunderstand ... the above photo that shows the hooves from the barrier island off the coast of GA -- I am certainly not advocating that we ever leave our own domestics in such a state of hoof 'neglect' but we do need, when trimming, to see that the edge of the wall has some 'bite' to it for traction IF the season and terrain dictates the need! So there's my 'comment' in reply to the gentleman who inquired about the Mustang Roll ... a great question that came in to me at just the right time! Perfect sequencing in our series about pasture vs. natural trim. Oh -- speaking of which -- what do you usually see with a "pasture" trim? What did we talk about last post? .. yep, take a look back, read again, and then couple that with today's information. Discussion is always welcomed of course -- questions? Comments? Please post below! And I hope this post helps to clarify any questions about the Mustang Roll on our horses' hooves. Have an awesome weekend! See you next Monday.